Marianjoy Rehabilitation Hospital's Driver Rehabilitation Program offers comprehensive and highly regarded driving education to help individuals with disabilities learn (or relearn) how to drive and gain driving independence. A fleet of adaptive vehicles can be configured to suit individuals with varying disabilities. Watch a video about the program. Evaluation and education for experienced drivers who have acquired a disability. Evaluation and education for people with disabilities who are interested in getting a driver's license for the first time. Comprehensive evaluation and examination for older adults to determine whether they can still drive safely. A low-vision program for teens and young adults. The 2.5-hour driver evaluation is designed to provide a comprehensive, objective appraisal of a person's ability to drive. It occurs in two parts: Part one is a clinical occupational therapy evaluation that assesses the individual's vision, perception, cognition and motor function. The second part is a behind-the-wheel evaluation, which takes place in one of Marianjoy's driver rehabilitation vehicles and assesses an individual's ability to operate a motor vehicle safely. At the conclusion of the evaluation, the driver rehabilitation specialist will discuss with the client and family (as appropriate) recommendations for driving. Questions regarding adaptive equipment, restricted driving or alternative transportation will also be addressed. The final evaluation report, with recommendations, is sent to the referring physician. Marianjoy's Driver Rehabilitation Program has preparatory equipment to train patients before entering vehicles, as well as a fleet of sedans and minivans. Training equipment includes an indoor adjustable ramp to simulate minivan entrances; a steering effort simulator; and hand-control models to try, for those who are unable to drive with their feet. Each of the vehicles can be adapted with necessary equipment to meet the client's particular needs. In addition, the wheelchair-accessible minivans are designed to enable individuals to drive from their wheelchairs or to transfer into the driver's seat. Marianjoy's driver rehabilitation specialists work with students experiencing vision, cognitive and/or motor impairments. 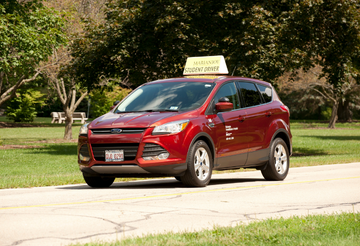 Marianjoy is the only driver rehabilitation program in the Chicago area that is also a certified driving school. We meet the state requirements for driver education and can coordinate services with the students' high schools. Marianjoy's Driver Rehabilitation Program is the only one of its kind in Illinois to offer low-vision services, which is a highly specialized component of the driving program. Our staff works with vision specialists to evaluate and train individuals who are not able to meet Illinois state driving requirements with conventional corrective lenses. As advocates for our clients, Marianjoy's driver rehabilitation specialists are available to accompany an individual to the Secretary of State's office for their driving test. We will also work with local vendors, on the individual's behalf, to obtain adaptive equipment needed for a client's vehicle. Marianjoy Driver Rehabilitation staff are all occupational therapists who have completed extensive training and testing to receive the designation of certified driver rehabilitation specialists. Marianjoy Driver Rehabilitation staff are also members of the Association of Driver Rehabilitation Specialists and the National Mobility Equipment Dealers Association. Participants must be at least 15 years old and require specialized evaluation, education or equipment. A prescription from a physician or vision specialist stating "OT driver evaluation and treatment" is required to schedule a driver evaluation. The prescription can be faxed to 630.909.7151. To schedule an appointment, call 630.909.6080.